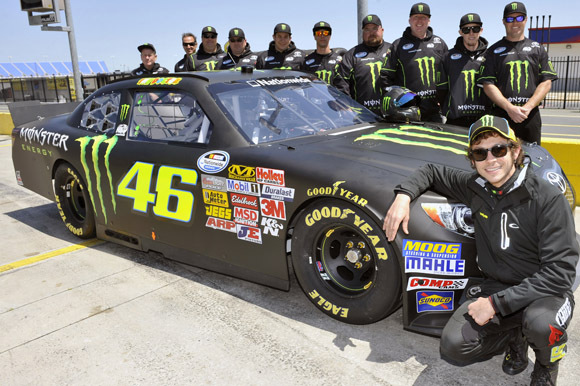 Motorcycle racing legend Valentino Rossi took on a new motorsport challenge this week, swapping two wheels for four to sample a 650 bhp V8 NASCAR Toyota Camry. The multiple World Champion and works Yamaha MotoGP racer had some special tuition before his laps, from none other than the most successful NASCAR Nationwide driver in history, Kyle Busch. After his laps of the superspeedway, Rossi was beaming: “It was so cool to understand the feeling. It looks like it’s a completely different type of racing than what we do in Europe and I expected something more like this – exciting, high speed and a great feeling in the corner. In the banking you have a lot of grip, so you are glued on the racetrack. It was great, I enjoyed it a lot. 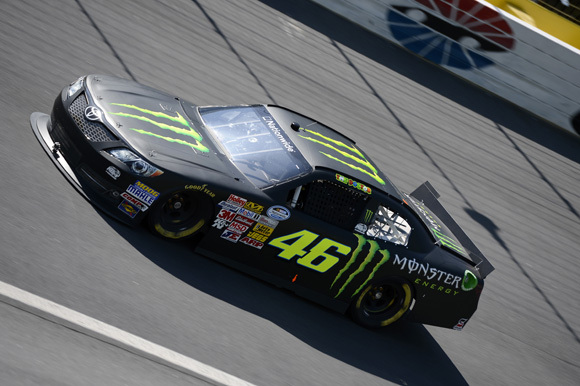 I love driving the race car, and I always have, so it was exciting to drive a NASCAR. “At the beginning it was a bit strange because it’s difficult to go straight. But after some laps, I had a lot of confidence and I was able to go faster. I must say I got along very well with Kyle. He’s a good guy; I like him and he gave me a lot of important advice.” Rossi slotted in his Camry test right after his sixth-place finish in round two of MotoGP in Austin, Texas; he races next in the Spanish Grand Prix on 5 May. 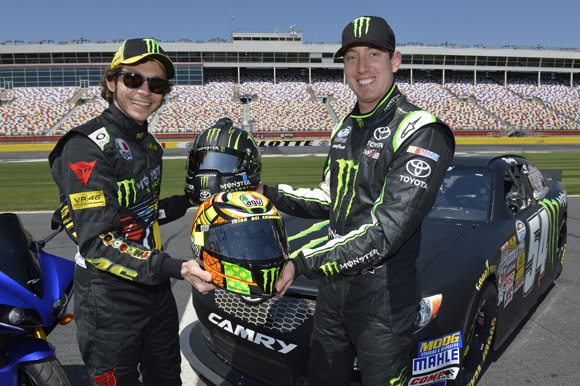 This Saturday sees Busch and his #18 M&M’s Joe Gibbs Racing Toyota in action at the Richmond International Raceway in Virginia for the Toyota Owners 400 – he’s looking for his fifth consecutive win at the three-quarter-mile oval.